Last day at a job usually means a round of appreciatory, sweet farewell emails to everyone right from your colleagues who helped through the journey, or the managers who inspired you to give your 100%. Not this employee at IBM, though. His job at IBM was less than perfect, and he attributes it solely to his managers. 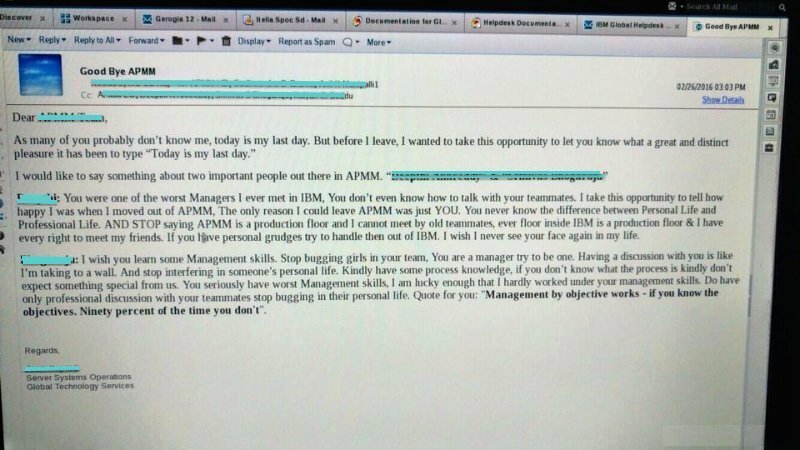 In his farewell email, not only does he not make any bones about his real reason for leaving, but also openly and brutally castigates his managers at IBM. While the names of the managers and the employee himself have been blocked out for privacy reasons, here’s a snapshot of the email that’s been shared on Linkedin by a person in possession of a copy of the email. He calls one of the managers, “one of the worst managers at IBM” and goes on to say how the manager in question doesn’t know “How to talk with team mates. “You never know the difference between personal life and professional life”, says the affected employee and accuses the manger of not allowing the employee to meet his work friends on a production floor. The employee then advises the other manager in question to “learn some management skills and stop bugging girls in the team.” He calls this manager out also on invading the personal lives of his team members. The missive also questions the process knowledge of the manager. “If you don’t know what process is, kindly ask us”. “You seriously have the worst management skills”, the email goes on to say of the second manager. While some people assert that the email was called for and glowing issues with management should be brought out, some are of the opinion that it was in poor taste to be so open about your criticism against a particular person, especially since the email was sent to a large group of people. The employee in question also seems to, with one email, have burned bridges with his former company, a no-go for most employees about to quit a company. The email does well however to bring up some pertinent points about corporate culture and management skills. The points about manager’s intervention in employees’ lives and the ability of the manager to be well versed in the department they manage are worth pondering over.